It feels so surreal. I have never imagined life in Form Six had ended. I don't have to study for STPM anymore! Yesterday was my final paper. Won't be elaborating on how I did in those horrible papers. For now, I just need a miracle. I can't believe it. I remembered quite clearly the first day I stepped into my Form Six life last year. And I thought I had a long way to go. Now, the long way is well passed through. 3 more papers to go.. I'll regain freedom once everything is over. 3 more papers to go! The papers previously had been suicidal. It was really shocking to witness yet another departure of a loving family member of the Terrapins. Tragic. Gruesome. Totally unexpected death. 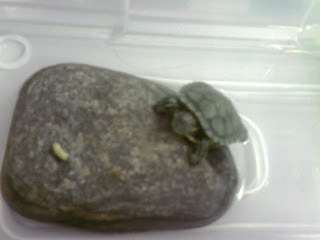 My mom was bathing the twelve princes and princesses of the Terrapin royalties when she noticed something was wrong. Nana lost his sight! His left eye was shut tight while the other, you cannot even call that an eye anymore. All my mom could see was a hollow socket where the eye should have been. 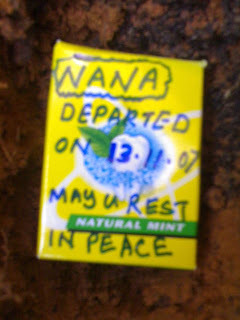 Below is the picture of the stiff Nana. Why? Simply because he was still healthy the day before yesterday. He just can't die overnight, can he? So the best inference to his death is, HE IS MURDERED. Time of murder was between 10.30 pm last night and early this morning. All his eleven friends are under suspect. Light, Missa and Sunnie are exempted as they have an alibi who is of course, ME. 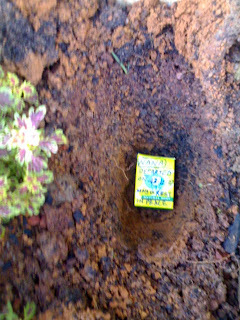 Nana was buried near Nani and Nano. Good bye, Nana. May you rest in peace. Didi, Harry, Rayar, Aideel and Fitry. It is very sad to hear about deaths. However, we must not fear death. I am sure Nana is having the best of his life now up in heaven. Just like the fun Nani, Nano and Saffy is enjoying right now. When our time is up, we can see them again. The meaning of true love. Not any other typical love story. 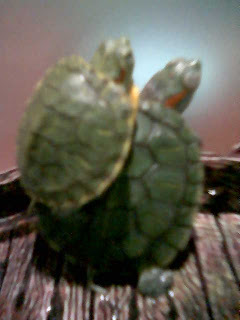 It's a story between two sick terrapins which never left each other for another. The kind of L.O.V.E. I am talking about is sisterly love. Don't think narrowly, okay? "No one can ever separate us. When I was sick and you were recovering, you are always there to protect me from harm and danger. We are FRENZ FOREVER." Oh, that is so sweet! Anyone's love story can be greater than theirs? 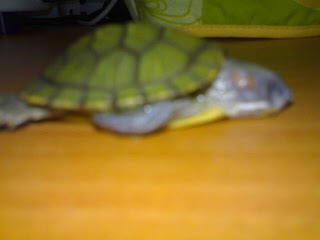 On the other hand, there is another terrapin whose sickness is still a mystery to me. Her name is Sunnie. She needs a friend too. I love you, Sunnie. So, would you please kindly eat your food? P/S: Please let me be wrong! I want to come out and join you all for Deepavali celebration! That's our dog. Remember The Two Stupid Dogs cartoon? She has the potential to be the third one. She's so stupid. How can she get out through the gap? She thinks her body is as thin as paper, I guess. 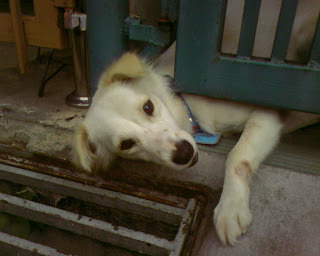 P/S: All dogs have their own stupidity. There are no smart dogs, really. As soon as I opened the front door this morning, this is what I saw. Oi, Crystle! Having a war ah? She was desperate for shoes to bite I guess. Or was she showing off to her stray boyfriends how blissful her life is with the many varieties of shoes she can actually bite? Today is the official last day of school for the Upper Sixes. I wonder why I am so happy. Hey, I still can see my friends during the most stressful time. On the 19th onwards! LOL..
We were supposed to look elsewhere and Fatin had this crazy idea: Why don't we frown at each other? However, the photographer was too slow and as you can see above, Fatin was going to burst out laughing! Haha..
Cheon Yuen attacking Adura with Eve as the witness. This is so interesting! Adura, fight back!! Look which wacko is trying to jump down from the building. 'Hey, Farhan! Snap my handsome face!' said the other Farhan. I want to see some pictures!! Lyn Yee and Fatin having a cat fight. I am prettier! No, you are not! I am more gorgeous! Ouch! It's painful! Stop that!!!!!!!! Eve and I outside the exam 'hall'. Classroom actually. SMI's so, so poor. This school does not have enough halls. The two other guys from USA1. Two of the three thorns among the roses. Can you spot some orbs in this picture? Those whitish circles appeared even when there's no flash when the picture was captured. Paranormal phenomenon? I hope not. Our BM teacher and us. He's a very smart-looking man. Not only smart-looking actually, he's really smart especially in solving problems involving psychology ones. This is what is needed by the students who feel constant stress in the blues of exam. After school, I went to Happy Valley which is located just opposite the school with Eve, Adele and Chin Hwa. They are crazy people, I tell you. What do you think you are looking at? I am cool and you are not. An expression worth millions of dollars! She's trying to shoot herself at her temple. Someone call 999 please! Okay, now she's cured. She's so happy to be a normal person again that she's smiling. Welcome back to sane city. Welcome to Happy Valley! They have some promotions. For a short period of time, I became the spokesperson for Happy Valley. Going wacko again! Blur Evelyn and cross-eyed me. Goldfish Eve and cunning-looking Adele. That is not all. we even made some videos from the shop. Enjoy. I received these pictures recently and I can't believe that puppy love is not meant figuratively but literally as well. This chihuahua was born in May this year in the northern Japanese city of Odate to the owner, Emiko Sakurada who said that the little fellow came into this world with a perfect heart-shaped pattern in his fur. Love. So madly in love! Aw!! I have to hug him! Super cute!! Here's a video of Heart-kun (yup, that's his name :D) and his owner! My bro said that the pictures have undergone photoshopping but I do think they are real. Wonder how will Crystle look like if she were to be in love? Can you visualize it yet?? Crys drowning in puppy love! I have plans for myself after the exam. First of all, I want to complete any unfinished cross stitches and a puzzle which was supposedly be framed before my exam. Look what procrastination has done to me!! I've been delaying my work and the truth is, I don't know what is doing it. December will be the month when I will spend my time cross-stitching and reading and updating this getting-mundane-site. So when will it be the time for me to rest? There's no such thing as resting when I have so much to do. Got to catch up with lots of things. I know it does not rhyme. But that's just what I am feeling now. My inference will be, the nearer it is to the examination date, the harder it is for me to concentrate. Why is it always like this??? I'm feeling so dejavu. It seemed that I had the same pre-examination stress in SPM and also PMR last time. Now, it has come back to "greet" STPM. P/S: Quote of the day - "Examination is not the most accurate instrument to measure one's ability to learn as it only covers as little as a drop of salt water from the entire ocean." So the question is, why does examination exist? The word with the big 'E' is still very strange to me.